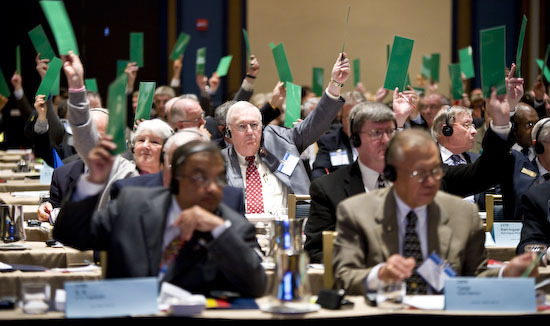 The Council on Legislation (COL), Rotary’s worldwide parliament, meets every three years and has the authority to amend the Rotary International constitutional documents. The district representative (delegate) must a Past District Governor and attends the COL meetings on behalf of the district. A COL representative can attend no more than three meetings. to report back to the District following each COL they attend. There are two kinds of proposal: an enactment, which would amend the constitution or by-laws of Rotary International or a club, and a resolution, which expresses an opinion or makes a recommendation to the Rotary International Board. It may seem a protracted process to change Rotary policy when the COL only meets every three years, but such is the democratic system in our very large and worldwide organisation. There are, however, other ways of advancing some proposals e.g. by way of “Memorial to the RI Board” and this can be done at any time. Advice on any of these matters can be obtained from the District’s COL representative. The closing date for proposals for the 2019 COL will be 31 December 2018. It is important to note that a club’s proposed legislation needs district support and endorsement, and the best time and place to get this approval, is at our district conference. The District Legislation & Resolutions Advisory Group is convened as and when required, to assist the district or clubs in regard to constitutional issues and on matters relating to compliance with the Charities Commission. The Group comprises the District Legal Advisor, the District Treasurer and the COL Representative; it may co-opt other members as necessary.